Women have been taking up rowing in huge numbers recently, and a very good thing too, but it is not such a recent phenomenon as one might assume. Here is an article from American sporting magazine The Outing, published in 1889. Don't laugh too hard at the opening paragraph. ROWING AS A RECREATION FOR WOMEN. ON looking over a number of photographs of English and American women possessing beauty, wealth, rank and social distinction, someone remarked with admiration on the noble carriage and proud poise of head as their most aristocratic and distinctive feature. “Is it merely a characteristic of high birth?” he inquired. “Perhaps,” answered a clever and observant friend; “but it is not always the divine heritage of a nobleman’s daughter, neither is it with an American woman the result of her forbears’ partiality for terrapin and canvas back. I think it comes from generations of riders and rowers. Now, the mothers as well as the fathers of these women spent no small amount of time and energy on their out-of-door sports. The days of the hunting season saw them on lively, long-legged mounts, briskly scampering over hill and dale in chase of the wily fox. In summer they pulled with swift, clean strokes their skiffs and shells over the many fine watercourses of their fair island. The article then goes on to discuss rowing techniques, boats and clothing suitable for women. The advice is surprisingly robust, especially for the Victorian era when we are led to believe women were put on pedestals and regarded as too weak and frail for anything more physical than petit point. Nonsense, says Margaret Bisland. She doesn't quite go as far as to say that women can do anything men can do (and sliding seat rowing seems to be off the agenda) but she comes pretty close. For a long time it was a fiction lovingly cherished by many that ladies needed light craft suited to meagre muscles. Imitation birchen canoes and pressed paper shells are no doubt very nice for maidens who wish to trifle elegantly among the swans on the lawn lake, For other purposes I would advise that all so-called “ladies’ outfits” be discreetly avoided. Now that a plain, hearty girl wishes to row, give her something up to her weight and worthy of conquest. A young girl of to-day, fond of out-of-door exercises and well up in her athletics, should hold the same honest scorn for a paper shell as she would have were a hobby horse offered her for hurdle practice. A well-made, three-seated, flat-bottom skiff, seaworthy and not too heavily built, will, with oars of the requisite weight and length, answer the purpose. Now for costume. Lay aside all the fashionable fancies and make up a flannel suit, simple and loose. A stout flannel skirt, quite full, short enough to escape the ankles and gathered or pleated into a broad belt, will be found the most convenient. A common sailor’s blouse or seamless jersey can be used as a waist, only remembering to make it so loose that every position in using the oars can be gained with ease and rapidity. Here the stays, however flexible and easily they may be worn, are an absolute impediment and should be abandoned. Their steel ribs will not admit of the bend from the waist and should be replaced by the corded bodice introduced by dress reformers. Brown hands and a rosy face, the consequence of much exercise under the warm sun’s rays, are no longer regarded as vulgar or unladylike, so a Tam o’ Shanter cap and no gloves will complete the outfit. I particularly like the idea of a Tam o' Shanter cap, which would be so much more stylish than the abominable baseball caps many oarswomen wear these days. On the southwestern coast of the tight little isle women row an annual regatta. These are the fisherwomen of Devonport and Saltash, rowing in four-oared galleys before a goodly crowd as excited, enthusiastic and open to wagers as that at the great races of Henley and Putney. 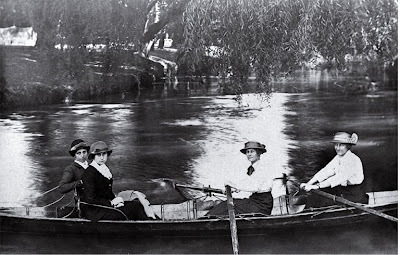 The stout-limbed, broad-shouldered amazons handle their oars with ease and skill; their brown, honest faces and bronzed bare arms are well set off by the red and blue blouses or jersey jerkins they wear. ‘Tis a fine sight, when the word is given and they start away, to note the movement of their muscular arms, the sway of their bodies and the long, sure pull, with a simultaneous flash of wet oars in the sunlight and the spray glitter from the feather. This picture from about 1892 shows what American women could do at that time. It is a crew from the ZLAC club in San Diego, the oldest all-women's rowing club in the world. 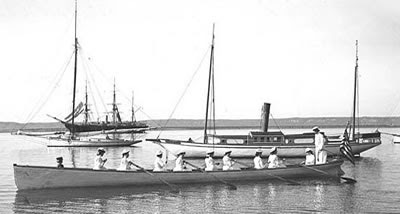 The photo at the top shows women rowing in Christchurch, New Zealand, from the Christchurch Library website. The complete Outing article can be read at the LA84 Foundation Library.